The Washington Capitals celebrate moving on to the Eastern Conference Finals after a 2-1 overtime win behind Patric Hornqvist #72 of the Pittsburgh Penguins in Game Six of the Eastern Conference Second Round. 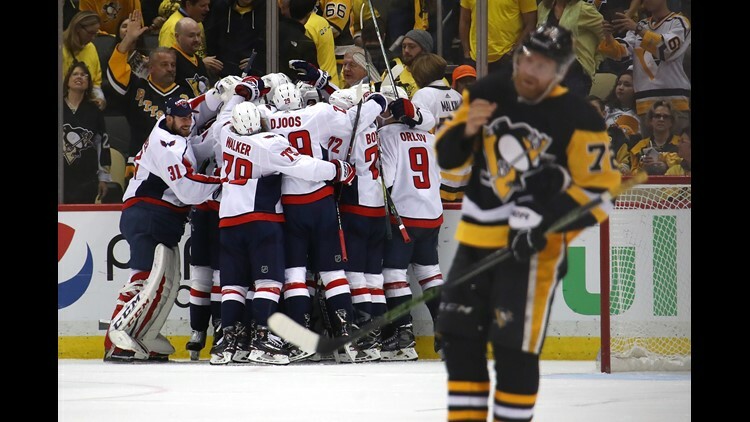 PITTSBURGH (AP) - Evgeny Kuznetsov's breakway goal 5:27 into overtime gave the Washington Capitals a 2-1 win over the Pittsburgh Penguins in Game 6 on Monday night, and a berth in the Eastern Conference finals for the first time in 20 years. Kuznetsov took a lead pass from Alexander Ovechkin and tucked the puck by Matt Murray to end Pittsburgh's two-year reign as Stanley Cup champions and propel the Capitals into the NHL's final four for just the third time in franchise history. Kris Letang scored for the Penguins and Murray finished with 28 saves but couldn't close his legs fast enough to stop Kuznetsov's forehand flick from in close as Pittsburgh's bid at becoming the first team in 35 years to win three consecutive Cups came to an abrupt end.